Despite higher economic growth, malnutrition levels are almost twice as high in South Asia as compared to Sub-Saharan Africa. As India’s 70th year since Independence begins, widespread progress is evident, but in rural India, where 833 million Indians (70%) live, people are consuming fewer nutrients than are required to stay healthy, according to a National Nutrition Monitoring Bureau survey. On average, compared to 1975-’79, a rural Indian now consumes 550 fewer calories and 13 gm protein, 5 mg iron, 250 mg calcium and about 500 mg less vitamin A. In poorer areas, the situation is worse, as a survey conducted by Aajeevika Bureau, a not-for profit organisation, in 2014, across four panchayats in South Rajasthan indicated. Almost half the 500 mothers surveyed had not eaten pulses the previous day, a third had not eaten vegetable and almost none had eaten any fruit, egg or meat. As a result, half of all mothers and their children under three in these areas were undernourished. This data has implications for Prime Minister Narendra Modi’s Make-in-India and Skill-India programmes for economic growth. “The consequences of child undernutrition for morbidity and mortality are enormous – and there is, in addition, an appreciable impact of undernutrition on productivity so that a failure to invest in combating nutrition reduces potential economic growth,” this 2015 World Bank report noted. Despite higher economic growth, malnutrition levels are almost twice as high in South Asia as compared to Sub Saharan Africa, V Ramalingasami and Urban Johnson wrote in a seminal 1997 paper, titled Malnutrition: An Asian Enigma. While the lower status of women in South Asia was offered as an explanation, almost two decades later, rural Indians just do not seem to have enough food to eat. India’s economy has been growing consistently since the early 1990s. The country has survived the recessions that started in the US in 2008 and affected large parts of the world. 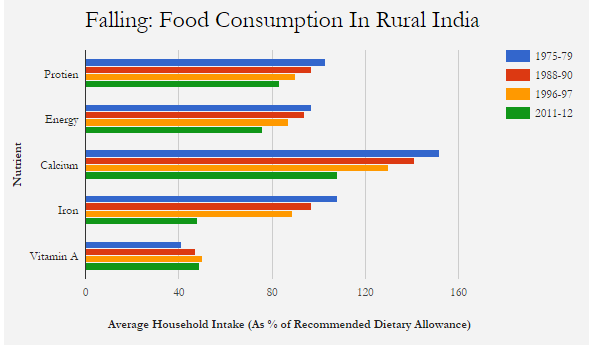 What is not as well known is that over the same period, more and more people in rural India were eating less and less. While growth of gross domestic product is estimated every six months using different methods, nutrition levels are estimated once every 10 years, leading to data gaps that IndiaSpend reported in July 2016. Nutrition monitoring has been defined by the World Health Organisation as the measurement of the changes in nutrition status of a population or a specific group of individuals over time. The National Nutrition Monitoring Bureau was set up in 1972 to monitor the status of nutrition in rural India across 10 states. The Bureau conducted nutrition surveys in rural areas in these 10 states over three time periods: 1975-79; 1996-97 and 2011-2012. These surveys provide us a temporal understanding of food intake among rural India over the past four decades. One would imagine that with a growing economy over these years, people would have more food in their plates. Instead, the intake of all nutrients decreased over these four decades. Why is this happening? The National Nutrition Monitoring Bureau survey also revealed that over 40 years, the proportion of landless people in rural areas grew from 30% to 40%, and the proportion of people who were owners and cultivators decreased by almost half. Meanwhile, food inflation in India increased at a faster rate than overall inflation (10% versus 6.7%). Within overall food inflation, the price of pulses, fats and vegetables rose quicker than that of cereals. The result is that fewer people can buy these foods. So, most rural people are neither growing food, nor buying it in adequate quantities. There is a caveat here. Despite declining nutrient intake, malnutrition levels have decreased over the years. In absolute terms, however, these levels remain among the highest in the world, as IndiaSpend reported in July 2015. India has reduced malnutrition, but it is 13 times worse than Brazil, nine times worse than China and three times worse than South Africa. Yet, India does not take policy action for identifying this hunger, even 69 years after Independence. In 2015, the National Nutrition Monitoring Bureau – the only source of longitudinal data on nutrition levels and food intake across 10 states of India – was shut down. The shutdown makes sure that we will not encounter such uncomfortable facts in future.